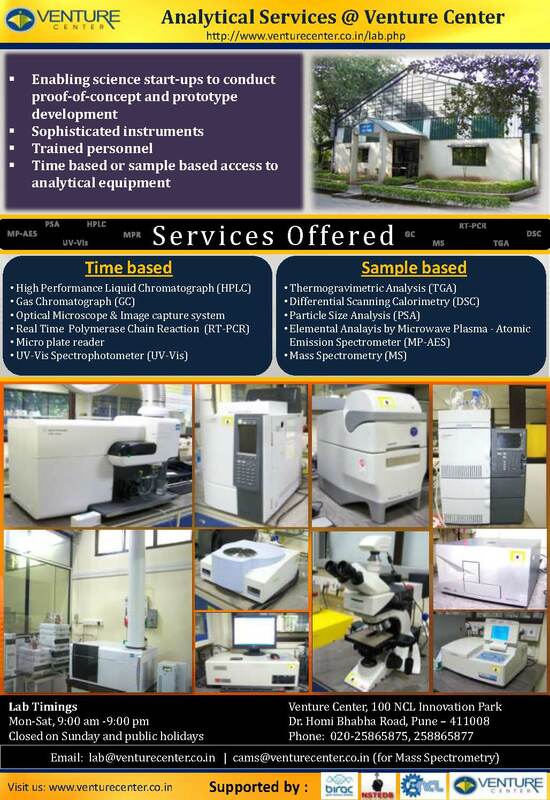 The ecoPartner program is an effort of Venture Center to engage with service providers and eco-system partners who contribute to enriching the innovation ecosystem around Venture Center (in NCL Innovation Park) by offering appropriate and cost effective services of interest to scientific startups and technology provider organizations. The program allows Venture Center to provide hot desking services (and occasionally other services)to eligible eco-system partners and thereby allow unprecedented access to Venture Center's network of innovators, entrepreneurs and start-ups. Applicants should offer services of special interest to scientific startups. Applicants with a past history of formal association with Venture Center, its incubatees (present or past) or institutions in the NCL Campus (NCL, IISER, URDIP) especially in technology/innovation/ entrepreneurship support roles shall be given preference. Reference letters are highly recommended. 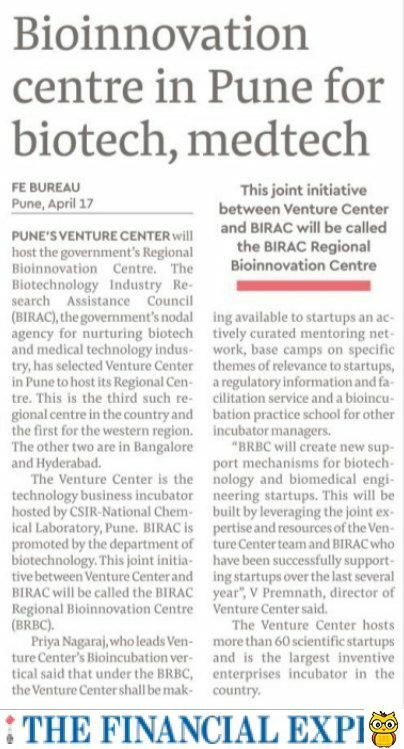 Preference will be given to applicants who have a past history of association with Venture Center via its events, workshops, training programs, mentoring sessions etc. Applicants who offer specially tailored services and/or preferential terms to Venture Center incubatees shall be given preference. Selected applicants shall receive services on the same terms as other incubatees and as per standard terms announced via the Venture Center website. The total space allocated to eco-system partners shall not exceed 10% of the total lab and office space available at Venture Center at any time. Services shall be made available for terms of 1 year at a time. Decisions on extensions shall be made based on contributions (during the past year) of the eco-system partner towards enriching the innovation ecosystem in the NCL Innovation Park (NIP). Various activities of the eco-system partner that contributed to enriching the eco-system shall be given points and a benchmark point shall be set for partners to qualify for extension. Venture Center reserves the right to select resident eco-system providers so as to plan a balanced and diverse eco-system, avoid/minimize overlap in service offerings and maximize the benefits from the space allocated to the eco-system partner. Please note that ecoPartner program members will not be eligible for service tax exemption that science based startups at Venture Center (a DST-NSTEDB approved incubator) are normally eligible for. The Venture Center's management reserves the right to refuse any applicants without ascribing any reason for the same. Venture Center shall provide its services on the assumption that the project team will raise funding (ex: grant funding) so as to also accommodate Venture Center's listed costs in offering those services. The minimum cumulative points (benchmark) for qualifying for extensions shall be 30 points per year. A larger the cumulative score will be assumed to indicative a deeper engagement with the innovation ecosystem in NIP and shall be viewed favourably. Please fill up the application form of the concerned service that is sought. Attach a sheet describing " Proposed service offerings for scientific start-ups and entrepreneurs, along with indicative pricing and special discounts, if any"
Attach Reference Letters from members of the innovation eco-system at NIP. Attach a short note on history of association of your company with Venture Center, its incubatees (present or past) or institutions in the NCL Campus (NCL, IISER, URDIP). Submit your application to the contact person given below. The Venture Center team will get back to you to indicate next steps. As of 1 May 2017, Venture Center has announced a new category under the ecoPartner program called ecoPartner++. Eligible entities shall be permitted to use the Board Room, Conference Room, Training Room, E-ClassRoom and Lecture Theatre at concessional terms applicable to resident incubatees.